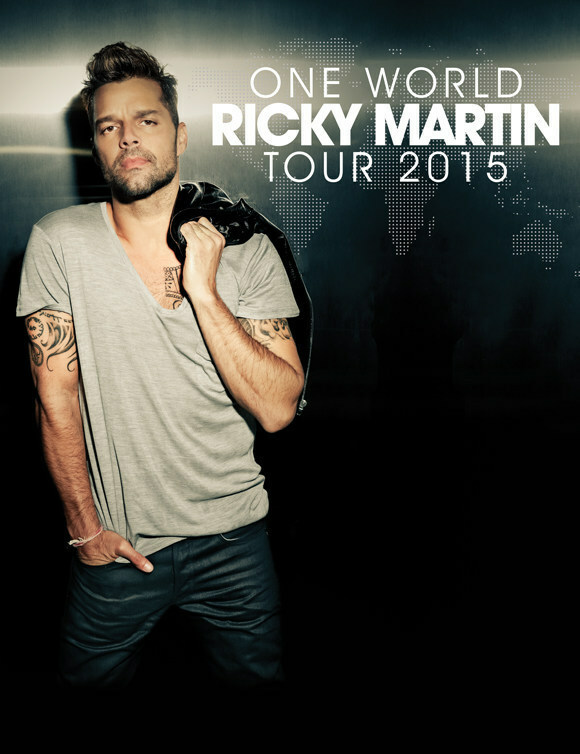 LOS ANGELES, Feb. 9, 2015 — GRAMMY® Award-winner and music superstar, Ricky Martin, announced the North American dates for his ONE WORLD TOUR in support of his brand new album, A Quien Quiera Escuchar, set for release tomorrow, Feb 10. The 20-date tour, promoted exclusively by Live Nation, will take the acclaimed entertainer to cities throughout the U.S. andCanada starting on Sept. 15 in Las Vegas, Nev. with shows lined up in New York City, Los Angeles, Toronto, Washington D.C.,Chicago, Miami and more. A full list of tour dates is below. Tickets go on sale starting Feb. 20 at www.livenation.com. The multi-platinum award winning artist’s highly-anticipated 10th studio album, A Quien Quiera Escuchar, available in all distribution formats, and in two versions – original and deluxe – is possibly the most personal and intimate to have been released by the acclaimed singer, philanthropist, author, actor and businessman. The lead single, “Adios,” has already amassed over 14 million views on Vevo since its release in October. Produced by Colombian composer, arranger, and pianist Julio Reyes Copello and recorded between Australia, Puerto Rico, Los Angeles and Mexico City, A Quien Quiera Escuchar showcases his vocal maturity and depth of artistry. In support of the album, Ricky Martin will be making several national television appearances including Univision’s Primer Impacto(Feb. 9) and Despierta America (Feb. 10), Telemundo’s Al Rojo Vivo (Feb. 10) and Un Nuevo Dia (Feb. 11 & Feb. 12), The Ellen DeGeneres Show (Feb. 11), The TODAY Show (Feb. 12) and the Wendy Williams Show (Feb. 13). Ricky Martin has sold nearly 85 million albums worldwide including six Billboard #1 albums, launched several world-spanning tours selling out shows in nearly 60 countries and has won numerous accolades including six GRAMMY Awards, ten Billboard Music Awards and has earned worldwide recognition for his humanitarian work. All dates below on sale Feb. 20 unless otherwise noted.